In just two short weeks from today, I’ll be cruising down the highway somewhere in between Minneapolis and Kansas City with two of my best ladies. Our priorities for this trip are pretty straight-forward…thrift-store shopping and eating inappropriate amounts of barbecue. 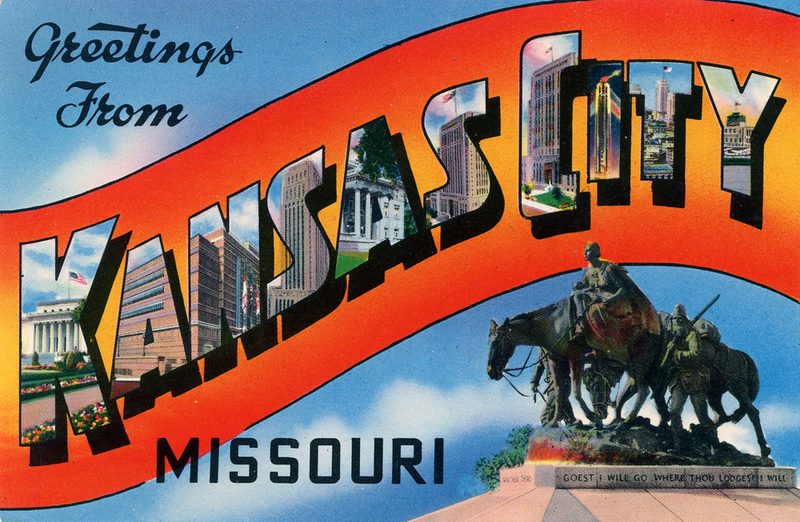 Since none of us has ever visited KC before, and since I know I have the smartest, most well-traveled readers, I thought I’d ask y’all for some tips. Do you know who has the best barbecue? Got leads on some dive bars we should for sure check out? Know of a vintage store I’d be remiss in skipping? What about thrifting? Where the heck should we go!? I’m all ears about it all, from hotels to shopping, barbecue joints to bars. While I wait for your recommendations to roll in, here are some musical gems about our destination for your ears. This entry was posted in Uncategorized and tagged good times, kansas city, road trip, thrift-store shopping, thrifting by highplainsthrifter. Bookmark the permalink. Hey, It’s Sam (the one who did alterations some time back) I’m from KC! You HAVE to go to Oklahoma Joe’s BBQ – it’s literally off a gas station and you have to stand in a long line usually…. go hungry at a weird time of day (4?) and order the ribs!!! Donna’s Dress shop is adorable and I think you ladies will be inspired, and there’s also boomerang – both for vintage. Just a really cute boutique that has amazing jewelry is Colfax, right around the corner from boomerang (all of these places are within a few blocks). Tons of bars around the Westport area that are fun (riot room, dark horse, record bar usually has good shows) – don’t go to Power and Light unless you just want to see it. it’s stupid. If you want to drive 40 minutes south to Harrisonville (where I’m from) the Trade Fair is sweet. only occasionally do you find clothes (although there’s one booth that always has amazing boots and jackets). but just a little bit of everything there. also a couple of thrift stores in town or maybe you can get lucky with garage sale season. For brunch I’d recommend Succotash or You Say Tomato. Sam dear, thank you, thank you, thank you!! I was wondering if there are flea markets there, so the tip on Harrisonville is priceless. I have a friend who worked at You Say Tomato and also said their brunch is amazing. I’m so excited to check all these spots out! Thanks a bunch for the tips!! Sam, you beat me to it! Oklahoma Joe’s is the BBQ I was telling you about, Meghan! Literally the best I’ve ever had in my whole life. Nom. Nom. Nom. Meghan! This is so exciting! First off though, I wanted to tell you what a great time I had thumbing through the racks at last week’s Mighty Swell! Now, down to business! I’m another Kansas City gal, and I’d have to second the suggestion of Oklahoma Joe’s, Gates is right up there for me–and quite an experience–and don’t forget to order some burnt ends–a KC original! I’m a bit partial, since it’s my family’s establishment, but you ladies really must go to Andre’s while you’re in town! It’s Swiss cuisine, chocolates, and pastries…and the tearoom at the Main St. store is totally cute for a quick post Plaza-walking afternoon pastry or pre-thrifting luncheon. If their trailer has hit the streets, stop by Fresher Than Fresh Snowcones, or their newly opened sister store–Little Freshie for some tasty treats. I would also recommend La Bodega for their happy hour menu of delicious tapas, Royale Bistro, Manifesto for a crafted cocktail, and Blanc Burgers + Bottles for the best damn burger in town–putting MPLS’s Burger Jones to shame! As far as shopping goes, I’d have to agree once again that you’d probably love spending some time at Donna’s. The shop is the sweetest, and it’s so bright and cheerful…a fun spot. I’d add Rock Candy Boutique, Vintage Vogue, Re-Runs, and Boomerang to that list as well. I also like to check out the River Market and Cowtown Mallroom to get lost in and find new treasures. When it comes to thrifting I love MAJ-R Thrifts, and will duck into the Goodwill and Salvation Army’s around town as well. Also, the Savers locations throughout town can be hit-or-miss, but are generally fairly well stocked. Look into swinging by Hammerpress, a local Letterpress. Their paper goods are awesome, and they have gorgeous show posters! Spending an afternoon in Parkville might be fun as well! There are some really fun boutiques, vintage shops, and antique stores there. Might be worth a look-see! I’m so excited to hear about all your adventures. Take lots of pictures, and be sure to let us know what your journey yields! Enjoy the plains!